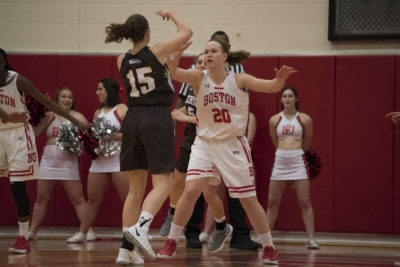 The Boston University women’s basketball team fell to American University 61-54 Wednesday night at Case Gym. After trailing by 17 points at the end of the first quarter, the Terriers (10-14, 5-9 Patriot League) responded well, especially defensively, against the undefeated Eagles (21-4, 14-0 Patriot League). BU head coach Katy Steding said she was proud of how much better the team got defensively, but knows they need to start better and limit turnovers. Steding called an early timeout and was not impressed with her team’s start, which saw the Terriers trail 7-2 just 93 seconds into the contest. BU struggled defensively early in the first quarter, giving up 17 points in the first six minutes of the game. American junior forward Cecily Carl had nine of those points. Carl would add seven more to up her total to 16 in the first quarter. The Terriers turned the ball over to the Eagles eight times and trailed 26-9 after 10 minutes. BU finished the game with 24 turnovers, something Steding knows needs to stop, but she was also impressed with how the team overcame that. “For us to turn it over 24 times and then also be within seven of a really strong team and the league-leading team, even in our place, I thought we did a really good job tonight,” Steding said. Sophomore forward Nia Irving collided with American sophomore forward TaeKenya Cleveland early in the second quarter, but was able to return a few minutes later. The Terriers held the Eagles scoreless over the first four minutes of the second quarter. However, BU was only able to score four points in that span and still trailed by 13. Irving came back with a vengeance, scoring six quick points and bringing her team-leading point total up to eight for the first half. It was a much stronger second quarter for the Terriers, as they outscored American 14-6 and trailed 32-23 at halftime. Early in the third quarter, American senior guard Emily Kinneston converted a layup to put the Eagles up by 11. The layup gave Kinneston 1,000 points in her collegiate career. BU cut the lead to as few as seven with an Irving bucket, but an ensuing 11-0 run from the Eagles gave American a 43-25 lead. BU sophomore guard Vanessa Edgehill connected on a three late in the quarter to cut the deficit to nine. After scoring 26 points in the first quarter, the Eagles only scored a 21 combined points in the second and third periods, but still led 47-38 after three. Four straight points to begin the final quarter from Irving and senior guard Corrine Williams got the Terriers within five, but a four-point play from Carl gave American the nine-point lead back once again. Irving had a strong game, and was extremely successful getting to the free throw line and converting on her chances. She went 9-for-11 from the charity stripe on the night. Junior guard Lauren Spearman was given a solid 12 minutes, appearing in only her sixth game of the season. While her solid play may not appear on the stat sheet, only grabbing two steals and an assist, she was stellar on the defensive end of the court, as Steding noted. Spearman also scored her first two points of the season. BU got within as few as five in the quarter, but couldn’t get the game to a one possession deficit as they trailed 58-52 with a minute to play. Irving finished with 21 points and four rebounds, but it was not enough as American went home with a 61-54 win and remains undefeated in the Patriot League.